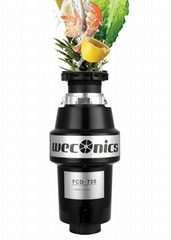 Foshan Weconics Electrical Co., Ltd is a very professional manufactory of household food waste disposers. 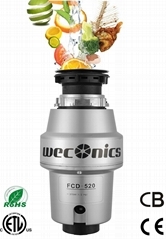 Weconics Food Waste Disposer is a modern kitchen appliance that deals with most of your food waste, consequently reducing the leftovers to the landfills. With the focus on the ODM & OEM business, experienced R&D, engineering and production ability, our company produce the high quality products. Weconics is located in the Shunde, Foshan City, Guangdong Province. This convenience transportation helps to improve our delivery efficiency. Our professional engineering team is years experienced with Food Waste Disposers. The team is great familiar with the performance and test standards. We also have great successful working experience with famous global companies. Moreover, the professional sales team gives you the best support. Our products are always related with great performance, unique design, stable quality, and easy installation. Importantly, we have passed the 10 years life tests. With the low maintenance rate, we have obtained several international certifications such as CE, CB, ETL, etc. Weconics is moving forward to its ultimate strategic goal of becoming a disposer leader in the world.